The Gypsy's Guide: The Happy New Years Giveaway! The Happy New Years Giveaway! Each year as the days are at their shortest and the holiday frenzy is at its peak, I set out on a great quest. You see, I am caught somewhere between digital organization and paper calendars. I have a smart phone, and I am a Google Calendars devotee. 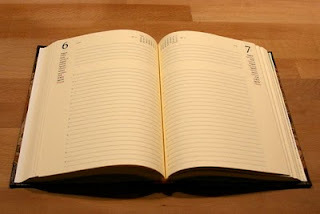 But I also search each year for a beautiful paper journal in which I take notes, make lists, and plan with pen in hand. This year I found a book in Venice that was just too beautiful to pass up, and I'm holding a contest to give it away. 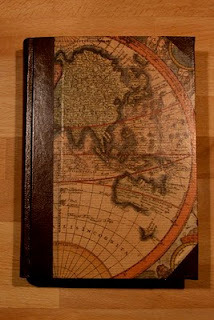 This gorgeous, leather-bound 2010 journal can be yours if you win my Happy New Years Giveaway! Covered in the print of an antique map, the journal has a leather spine and leather trim. The pages inside are dated (2010) with one page per day. The journal also includes a yearly calendar, address book, and maps. This gorgeous book is a perfect journal or datebook. It is the work of G. Biasin, one of Venice's finest craftsmen of paper goods. Both photos in this post are of the actual journal. What event are you most excited about adding to your 2010 calendar? Please include your email address in the comment form (your email isn't shared with anyone, and I will not send you email unless you win). We will choose a winner randomly and announce the results here on Tuesday, January 5, 2010. If you have family or friends who you know will love this giveaway, just click the little envelope icon at the bottom of this (or any) post to email it to a friend. Please, only one comment per person per giveaway post. Duplicate comments and Anonymous comments will be discarded. Please make sure that the email address in your comment form is valid (email addresses are never public). Winners must claim their prize within three business days after the date of notification of such prize. A Sweepstakes winner's failure to respond to the prize notification within the specified three business days will be considered such Sweepstakes winner's forfeiture of the prize and an alternate winner may be selected from the pool of eligible entries. If an entrant is found to be ineligible, an alternate winner may also be selected from the pool of eligible entries. To enter, you must be a U.S. resident, age 18 or older. Employees, partners and vendors of The Gypsy's Guide and their immediate family members are not eligible to enter. We will disqualify any entries that we believe are generated by scripts and other automated technology. When applicable, the winner may be required to execute and return within five business days an Affidavit of Eligibility and a Liability and Publicity Release to be eligible for the prize or an alternate winner will be selected. All prizes will be awarded. No substitutions including for cash are permitted, except that The Gypsy's Guide reserves the right to substitute a prize of equal or greater monetary value for any prize. Winners shall be responsible and liable for all federal, state and local taxes on the value of their prize. What a beautiful journal! You are so sweet to share a part of your trip to Venice. I'm going to cheat and say that there are 2 events I'd be most excited to add. One is the dates for our family trip to southern England in July. The other is the Travel Blogger Exchange conference at the end of June. I have two January plans for 2010 .. with one objective. 1) Attend the SDSU writers conference .. and 2)take the 30 day on-line writing program..Thought Threads.. in order to finally have something to pitch to an agent this year. Thanks for the thoughtful giveaway .. it is beautiful. A trip to the Passion Play at Oberammergau, Austria, next September promises to be the high watermark of 2010 so far! It will be followed by a week in the Italian Lakes when there will be an opportunity to revisit Padua, Verona and Venice. I'm already brushing up on the lingo with Buongiorno Italia as half the fun is adopting the mindset of the local people. I'm most excited about finally attending SCBWI's summer conference this August in Los Angeles. The most exciting thing on our calendar is our son's wedding in July. I'm most excited to add research travel for my new MN book! I'm excited about celebrating our 30th anniversary in April. What an amazing giveaway! I love that book! I'm most looking forward to adding graduation and *hopefully* a start date for a real JOB in the book! I've been on the lookout for a fun 2010 planner - this one is terrific. My most exciting upcoming event is a mid-May trip to Italy! I found your blog a while ago looking for Italy travel ideas - I just can't wait. It's been a dream of mine for quite sometime. That is just beautiful and I am so excited to be able to add BlogHer to it!!! I have always been a combination junkie myself. I like the pen and paper, but have to use the computer for all of my work items. Having the book for all o fthe personal items for the wife and kids activities is "PERFECT". I am most excited about going to the Reno Air Races in September and watching all of the kids sporting activities. How else do you keep track of three young boys and all of their activities? I'm most excited about my upcoming People, Places and Patterns Project: A photo expedition through Spain, Morocco, Kenya, Tanzania and Nepal. For once twitter steered me to some quality connect your blog. For 2010, I would love to be writing about my trip to World Cup in South Africa or the Kentucky Derby. For me, the most exciting thing that I would like to put on my calendar is my long-delayed trip to beautiful Italia.... reality suggests that I am more likely to be putting the release of my next major novel on the calendar before 2010 is half over. Both are wonderful things to consider, but I'd happily give up the book contract for Italy and a chance to meet the wonderful I know from so far away! Of course, I love Venice...and I am gonna go out on a limb to say that I am confident my best and most exciting thing I'll add to my calendar has not even presented itself yet! I'm just really excited to start a fresh page and ensure that 2010 will be a year that's better than the last. I look forward to more adventures around the world. I recently was laid off from my position as a speechwriter for a representative for our local legislature here in Phoenix. I've had this long list of things I've always wanted to do, and now that I have a bit of savings and quite a lot of time, I want to do something I've always wanted to do. I want to travel the United States from coast to coast by train and see all the great cities across America. That journal is exquisite...just like the place it came from. What am I most thrilled about? Hard to pick just one. I'm excited about all the special events/workshops coming up in wonderful places like Sedona. I'd love to write about a trip to the World Cup in South Africa. I'd love to see a trip to Sedona on my 2010 calendar. I wish I could put a trip to Italy on my calendar for 2010, but right now the most I can actually put on the calendar is a trip to the Star Trek Exhibit at our local Tech Museum. It should be a lot of fun. How thoughtful & generous to give something away! I was in Venice this summer (for the first time), on the solstice, and found the entire experience truly magical. Anyway, if my grant/funding comes though, I may spend two weeks in Fez, Morocco this summer, studying ancient Arabic music. The project would then culminate in an autumn concert by the women of The Rose Ensemble. Excited doesn't begin to describe how I feel about this opportunity! Thank you all for entering! So many of you have exciting things happening in 2010! The contest winner will be posted on Tuesday. Ciao!